Eve Rosekind, an art history major at Johns Hopkins University, was a summer intern in the Department of Conservation and Scientific Research at Freer|Sackler. For the past sixty-two years, the Department of Conservation and Scientific Research has used x-radiography in its study and treatment of Freer|Sackler objects. The department houses approximately 4,170 x-rays of paintings, sculptures, ceramics, and prints that have been examined by the museums’ conservators and curators. To preserve these images, the Smithsonian’s Office of the Chief Information Officer funded a project to digitize all of the department’s x-ray films. Digitization also makes the images more accessible and easier to use in studying the collection. My summer efforts focused on cataloguing and organizing the x-ray films and their corresponding digital images. In x-radiography, film is placed beneath a work of art, which is exposed to x-rays in order to create an image on the film. A visual record of the condition of the piece at the time it was taken, an x-ray can reveal how an object was constructed, as well as any subsequent treatments or changes. 1. The film becomes brittle and small parts begin to break off. 2. Known as “channeling,” the different layers of the x-ray shrink at different rates, causing air pockets in the film. 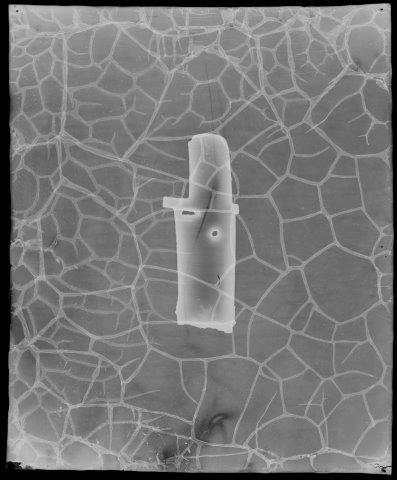 In the image above, the lines on the film are examples of channels on the surface of the x-ray. 3. The “vinegar syndrome.” The deterioration of acetate film is due to chemical decomposition that produces acids—in this case, acetic acid—that escape from the film in the form of a gas, causing a vinegar-like smell. One example of how an x-ray can show the construction of an object is the image of a Chinese ivory standing Buddha (pictured at top and digitized so that it could be included in this blog post!). The x-ray is a close-up of the Buddha’s head and upper torso. 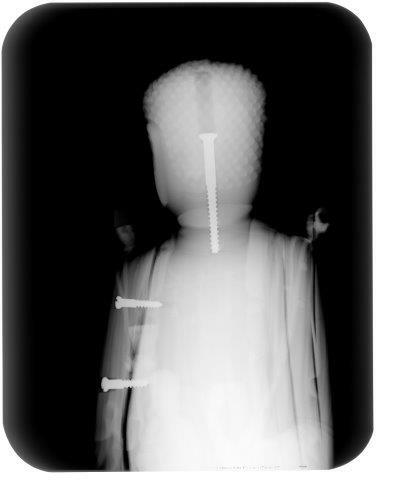 In the middle of the head, the large wooden screw that attaches the head to the rest of the body can be seen along with two other wooden screws in the shoulder. These wooden screws are part of the original construction of the ivory statue and are used to hold the multiple pieces together. The x-ray pictured above is of a Whistler etching on paper. In this image, the paper’s watermark is visible. A watermark is made by impressing a thin wire design into the paper when it is being constructed. The wire thins the paper, and when light passes through the design is visible. This specific mark, containing a fleur-de-lis beneath a crown, is known as the Strasburg Lily, which was used on paper throughout Europe from the seventeenth to the nineteenth century. 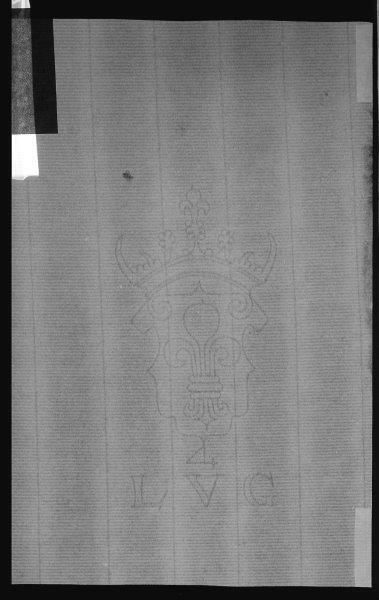 The letters LVG, seen below the lily, most likely refer to Lubbertus van Gerrevinck, a paper manufacturer in Holland and possibly in England. Revealing the watermark can help determine who made the paper, as well as when and where it was made. We can learn a lot from a work of art, and some of what we learn lies beneath the surface. Each x-ray image is unique and shows the object in a new light. Now that the films are digitized, it will be easier to share these images with researchers and the public. This summer, my project gave me an incredible perspective on an aspect of the museums’ collections rarely accessible to others.